TW Records. TW Records was the place for all your punk 7" - I clearly remember the frisson when seeing the display for Wayne County and the Electric Chairs (you will, I'm sure, fill in the title of that one). think TW Records gets a mention in Keith's book as an early source for their blues record collecting. TW Records, Eh? That was next door to Norman Toyes, the fishing Tackle store. I bought Selling England By The Pound there, when it came out. It had a BIG window display all to itself, with huge cutouts of the sleeve and images thereof. I have a memory of looking through the window one night at the cover picture and seeing it all lit up, and being enthralled by it. I knew I had to buy it. So I did. I took it home, and loved it right from the opening lines, which of course we all know and love. I still do. (Feb 6, 2013) Brian said:The Erith store had a purple paper mache ceiling of stalagtites, today it would look crap but in the 70's it just made the shop more awesum. 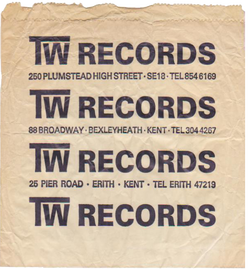 (Jan 14, 2016) I opened my first TW Records in 1965 and closed the last shop at Erith in 2005. Great times,it's a shame records shops had to close. Comment:Ray Sams.